Lawrence Welk was born in 1903 in the predominantly German town of Strasburg, North Dakota. Growing up on a farm, he first learned to play the accordion from his father and became consumed with a passion for music. In 1924 after taking a loan from his father, Lawrence left the farm to pursue a career as a musician, much to the dismay of his reserved family. At the age of 21, he formed a small band that toured mainly throughout the Midwest, calling themselves the Hotsy Totsy Boys and later the Honolulu Fruit Orchestra, after Welk scored them a sponsorship from the Honolulu Fruitgum Company. But the name they finally settled on was Lawrence Welk and his Champagne Music Makers. The band received a big break when they were asked to play the Edgewater Beach Hotel in Chicago and eventually became the regular house band at the Aragon and Trianon Ballrooms. In 1940, Welk, with his wife Fern and three children, moved to 1311 Ashland Avenue in River Forest. His eldest daughter Shirley attended Trinity High School while his two younger children Donna and Larry attended St. Vincent Ferrer elementary school, where Welk was also a devout church parishioner. Welk continued to travel frequently throughout the United States during the time that his family resided in River Forest, so he did not spend much time there. He began building a relationship with a broadcast station in California in the late 1940s, and by 1950, he signed on for a show in California. At that time, though Fern was reluctant to leave behind their peaceful home life in River Forest, the family moved to Los Angeles. In 1955, Welk’s stage show, which he performed weekly at the Aragon Ballroom in Santa Monica, was selected to be broadcast nationwide on ABC. The Lawrence Welk Show became a staple for families to tune in to every Saturday night, featuring popular music numbers and big band hits, always showcasing his signature light and bubbly “Champagne Music” style. 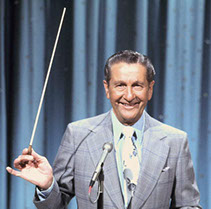 Welk’s intent was to provide a wholesome and family-oriented show, famously referring to the cast as his “musical family.” He continued to host The Lawrence Welk Show until 1981. He died in 1992 at the age of 89. Source: Welk, Lawrence. Wunnerful, Wunnerful! : The Autobiography of Lawrence Welk. Englewood Cliffs, NJ, Prentice Hall, Inc. 1971.